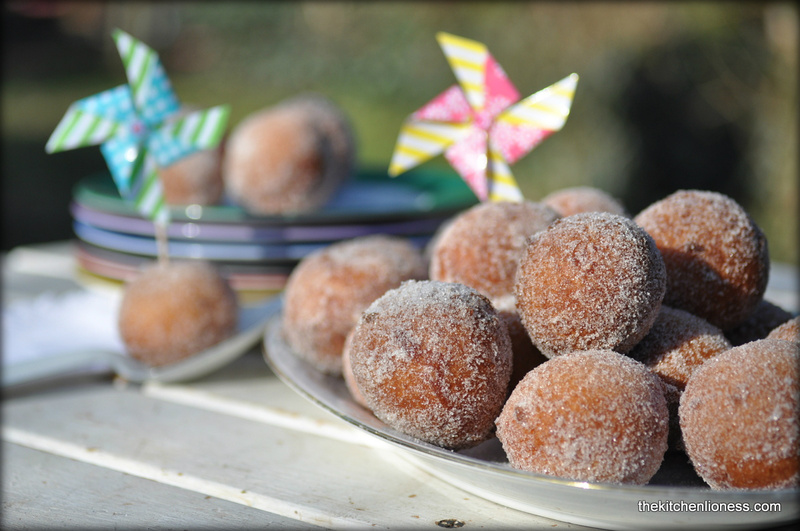 Today, on Rose Monday, I am featuring a recipe for wonderful Carnival Doughnuts. These doughnuts are considered to be a traditional pastry, fried in hot oil until deep golden-colored and served with a cinnamon-sugar coating. Heute, am Rosenmontag gibt es ein Rezept für wunderbare Karnevals-Krapfen. Krapfen sind ein traditionelles und sehr beliebtes Gebäck, dass in heißem Fett goldgelb ausgebacken wird und mit Zimt-Zucker bestreut serviert wird. Last Thursday marked the official beginning of Carnival. It goes by many names in German, depending on the region and dialect. Whether you call it “Fastnacht”, “Fasching” or “Karneval”, it is a time for revelry, humor, and satire. The actual celebrations of the German Carnival take place 40 days before Easter, it is like a last week-long party before Ash Wednesday and the beginning of Lent. Letzten Donnerstag war der offiziellen Beginn des Karnevals. Er hat viele Namen in Deutsch, je nach Region und Dialekt. Ob man es "Fastnacht", "Fasching" oder "Karneval" nennt, es ist in jedem Fall eine Zeit zum Feiern, des Humors und der Satire. Die eigentlichen Feierlichkeiten des deutschen Karnevals beginnen immer 40 Tage vor Ostern, es ist wie eine letzte lange Party vor Aschermittwoch und somit dem Beginn der Fastenzeit. On Thursday, the Carnival celebrations kicked off with Women’s Carnival Day at exactly 11.11 a.m. The next highlight is today on so-called Rose Monday. Marching bands, dancers, and floats parade down city streets. The participants of the parades throw confetti, sweets, little bundles of flowers and toys to the eager costumed crowds lining the streets where the parades take place. The elaborate floats often show caricatured figures mocking politicians and other personalities and thousands of dressed-up Germans are flocking the streets every year to watch them. An Weiberfastnacht um 11:11 Uhr gingen die Feierlichkeiten offiziell los. Und am heutigen Rosenmontag gibt es unzählige traditionelle Karnevalszüge in vielen deutschen Städten. Die Züge bestehen aus Abordnungen der Karnevalsvereine mit Prunkwagen, Kapellen, Tanzgruppierungen und oft auch aus so genannten Motivwagen. Letztere stellen oft Ereignisse und Personen des vergangenen Jahres in satirisch interpretierter Form dar. Von den Prunkwagen und den teilnehmenden Gruppen des Umzugs werden Kamelle und Blumen unter die Zuschauer geworfen. Almost every German city celebrates Carnival and organizes a street parade in its city center. The best and most traditional Carnival festivities take place in the Cities of Düsseldorf, Münster, Aachen, Mainz, and, of course my beloved hometown, Cologne. Fast jede deutsche Stadt feiert Karneval und organisiert einen Karnevalsumzug in der Innenstadt. Im Rheinland finden die besten und traditionsreichsten Karnevals-Feierlichkeiten in den Städten Düsseldorf, Münster, Aachen, Mainz und natürlich in meiner geliebten Heimatstadt Köln, statt. Tomorrow, on Shrove Tuesday, costume balls are held all over Germany, while the quiet Ash Wednesday marks the end of the frenzied fun. As with every longstanding traditional holiday, special sweet treats are also served during the Carnival, or "fifth season" season, as we call it. They are different depending on the region where they hail from. Morgen am Veilchendienstag finden viele Kostümbälle statt und am Aschermittwoch beginnt die 40-tägige Fastenzeit und somit steht dieser Tag für das Ende der Karnevalssaison. Passend zur so genannten fünften Jahreszeit gibt es natürlich jede Menge regional verschiedene, süße Karnevalsrezepte. Pastries that are particular to Carnival include the very popular Fried Almond Cookies (my recipe can be found here). 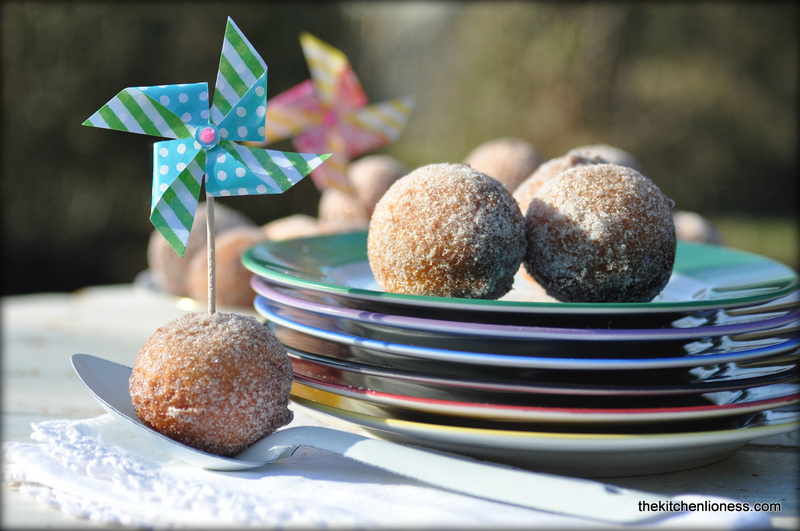 Today, I am presenting a recipe for Carnival Doughnuts. This year I baked them with a special flour, called Doughnut Flour. This is a special flour that is produced by an Artisan Flour Mill that we visited last week. 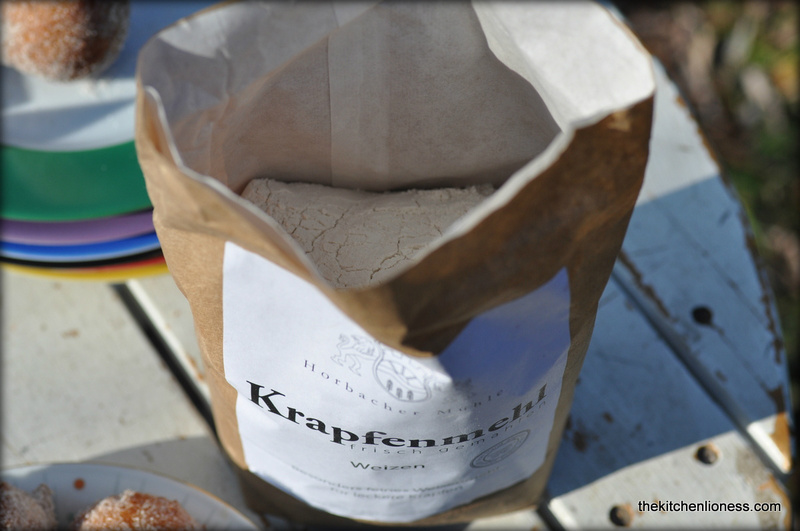 This special flour is offered for a limited time only and you can choose between a spelt and a wheat variety. On the back of the lovely flour package, you will find a recipe for doughnuts which served as the inspiration for this post. But let me assure you that the recipe also works well with strong flour. Zum traditionellen Karnevalsgebäck gehören zum Beispiel die allseits beliebten Mutzemandeln, mein Rezept findet ihr hier. Heute gibt es dann Krapfen – dieses Jahr habe ich sie mit einem besonderen Mehl gebacken, einem Krapfenmehl. Letzte Woche haben wir eine schöne Mehlmühle besucht, dort wird zu dieser Jahreszeit das spezielle Krapfenmehl produziert und für begrenzte Zeit zum Verkauf angeboten. Man kann zwischen Weizen und Dinkel wählen. Und die schöne Verpackung hat ein passendes Rezept auf der Rückseite und davon habe ich mich für dieses Post inspirieren lassen. Aber man kann dieses Rezept auch mit Weizenmehl Type 1050 backen. Heat the fat/oil for deep-frying to 175° C.
In a large mixing bowl, whisk together all the ingrediensts until you have a stiff, sticky dough. Taking two small spoons, shape little round dough balls. Carefully slide them into the hot oil and fry until they turn a deep golden color. That will take about five minutes. Using a spider cooking utensil, very carefully lift the doughnuts from the oil and transfer them to a paper lined plate - to drain off some of the fat. While they are still warm, transfer the doughnuts to a medium bowl with cinnamon sugar and coat them. Serve straight away. NOTE: * Quark is also known as soft white cheese or fromage blanc. Das Fett auf 175 °C erhitzen. Alle Zutaten in eine große Schüssel geben und solange miteinander verrühren, bis ein zäher Teig entsteht. Aus dem Teig mit Hilfe von zwei Esslöffeln den Teig zu kleinen Kugeln abstechen. Diese vorsichtig in das heiße Fett geben und die Krapfen goldgelb auf beiden Seiten ausbacken. Das dauert zirka fünf Minuten. Mit einem Schaumlöffel die Krapfen herausheben und auf Küchenkrepp etwas abtropfen bzw. entfetten lassen. Noch warm in Zimt-Zucker wälzen und sofort servieren. The recipe works really well. 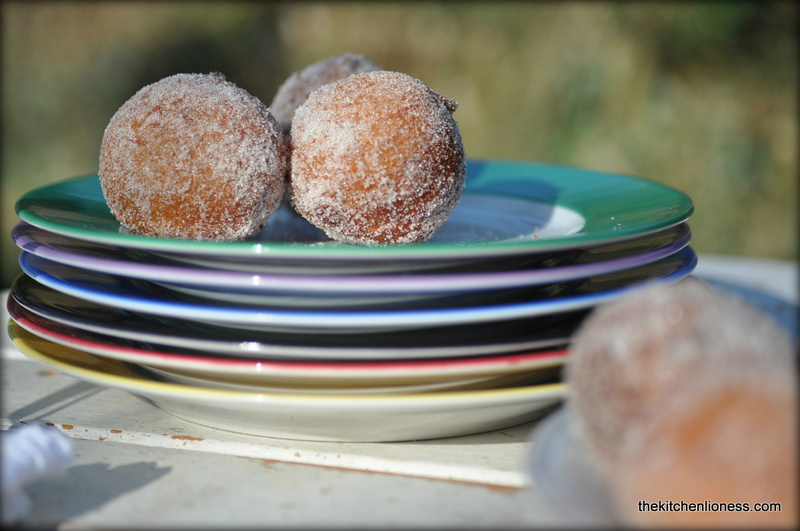 I used the spelt as well as the wheat flour and both versions of the Carnival Doughnuts tasted absolutely wonderful - especially when you eat them right away, while they are still a bit warm. 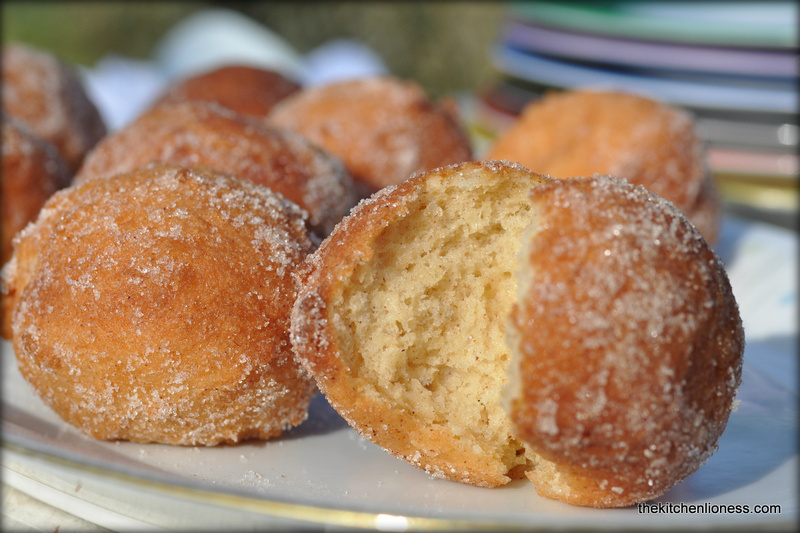 Traditionally, doughnuts can be prepared with either yeast or fresh cheese (quark) as in this recipe. If you use quark in your recipe, the freshly baked doughnus will have a distinct taste of that fresh cheese, like a little tang, which we really enjoy. And they are not overly sweet either. Just right. 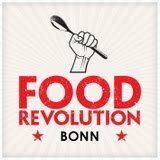 Das Rezept hat hervorragend geklappt. Ich habe die Dinkel- sowohl als auch die Weizenmehl-Variante ausprobiert und die Krapfen haben einfach nur wunderbar geschmeckt – am besten, natürlich warm. Man kann Krapfen ja entweder mit Hefe backen oder mit Quark, wie dieses Rezept. Wenn man frischen Magerquark für dieses Rezept nimmt, bleiben die Krapfen schön saftig und schmecken auch angenehm nach Quark. Wir fanden sie keineswegs zu süß. Mit wirklich wenig Aufwand sind diese Karnivals-Krapfen ohne Hefe schnell gemacht. So why not give these, no matter what season it is. 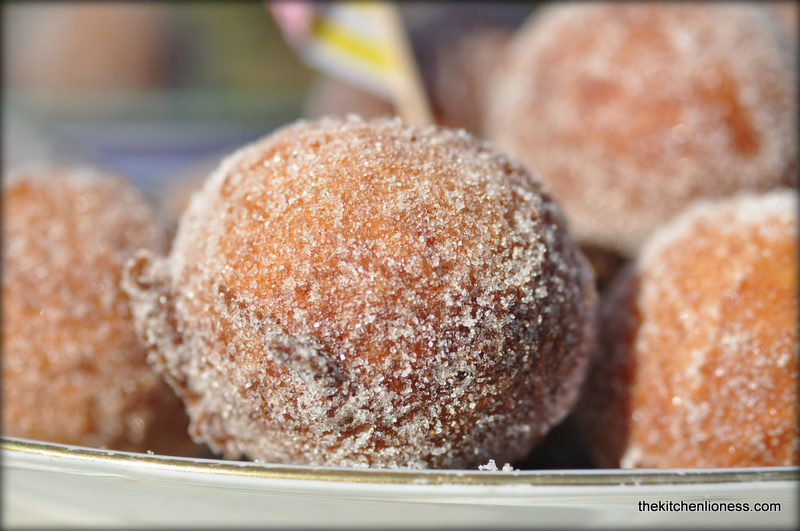 You certainly do not have to wait for carnival to give these lovely sweet treats a try. And you can even coat them with powdered sugar for a change of pace. Enjoy Carnival season while it lasts! For more information with respect to the Horbach Mill, please click here. Also ruhig mal ausprobieren, nicht nur zur Karnevalszeit schmecken die Quarkkrapfen ausgezeichnet. Wenn man möchte, kann man die Krapfen zur Abwechslung auch mal in Puderzucker wälzen. Für Informationen zur Horbacher Mühle, hier klicken. 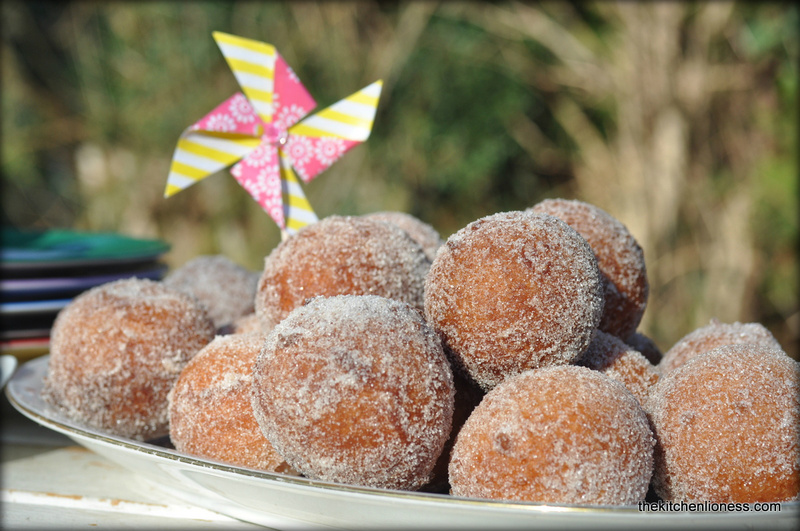 Dear David, glad you like these little traditional doughnuts - you can make them without a deep-fryer. 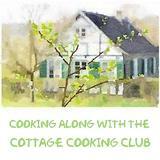 You heat some oil in a cast iron skillet and fry them in small batches - that works equally well. Kim, always so kind, thank you - glad that I can bring a smile to your face with my posts!!! These sound delicious. I love the idea of doughnuts that aren't too sweet and have fresh cheese. I've never made doughnuts at home. Maybe I need to try! I've never heard about Carnival before--what an amazing tradition. 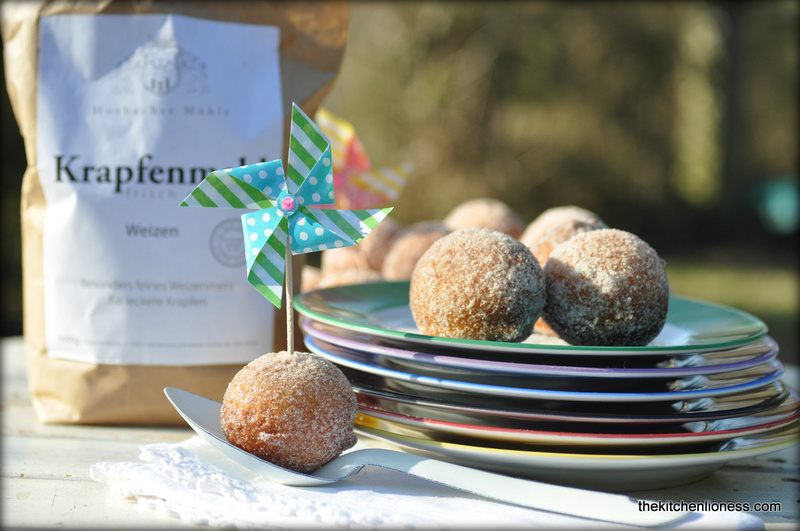 Dear Jora, these would be perefct for little Charlotte - the kids love them and you can even leave the doughnuts plain or dust them with just a bit of icing sugar. The fresh cheese lends a certain agreeable tang to these treats. Enjoy while warm and make any time of the year! Around here Carnival has a long-standing tradition - we always celebrate with the kids being off school for a few days and tons of parties, parades and great food.